The minimum legal 'drinking' age is 18. When going to bars and nightclubs you should carry identification to prove you are at least 18 years old. You may not be let in otherwise. No one may buy liquor from a bar or liquor store (bottle shop) unless they are at least 18. Buying liquor for a 'minor' is illegal. The drinking age of 18 applies for all wine tasting in the Hunter Valley. Rental cars are freely available in Sydney Airport and City Centre. All drivers must hold a current, non-probationary licence (in English or with English translation) or alternatively an international licence. Renters have to be 21 or older Travel Online can certainly help you with your rental car requirements, visit our campervans and car rental websites for details. The Hunter Valley is a casual place, so leave your suits and ties at home men unless you are planning to go somewhere special. A jacket and an open-neck shirt with a collar is acceptable almost anywhere in the evening. Hotels and top restaurants expect smart casual at night. A light jacket is handy if it's a cool evening. Bare feet are a no-no and thongs should be kept for the beach. Covered footwear is expected in most bars and restaurants though it is fine for ladies to wear dressy sandals. By all means dress up if you are going to dine at one of the many fine restaurants in the Hunter, but you won't feel uncomfortable if you don't. Remember the Australian sun is very strong, so cover up with a shirt and wear a hat and sunglasses on the beach and when you are touring. If you are visiting Barrington Tops you must take warm and waterproof clothing to wear hiking and bush walking. All banks have automated teller machines (ATMs) accessible 24-hours a day, generally outside the branch or in the foyer. Check with your card issuer that your charge or account-linked credit card can be used in this way, and at which bank as not all ATMs accept every brand of card. The Australian dollar is divided into 100 cents. One and two cent coins are no longer in circulation, but many items in shops and supermarkets are priced in odd amounts, such as $1.97 or $9.99. The law provides that the TOTAL bill is rounded up or down to the nearest 5 cents. So $19.97 becomes $19.95, $19.98 becomes $20.00. Coin denominations are 5c, 10c, 20c, 50c, $1 and $2. Notes are $5, $10, $20, $50 and $100, are colour coded and made from a plastic compound that will survive a wash or a swim. Australians drive on the left, which can be disconcerting for visitors used to driving on the right side of the road. Roads are generally good and major routes well signposted. Speed limits and distances are expressed in kilometres and vary substantially from 50 kph in residential and heavy traffic areas to 110 kph on freeways. Drink driving is a serious offence and heavily policed. Drivers can be stopped anywhere at random and subjected to a breath analysis test. Offenders are arrested and fingerprinted, so it can be a bad end to a fine evening or a long lunch. The legal limit in Australia is a blood alcohol content of .05%. The Hunter Valley is a quick and easy 2 hour drive from Sydney on the F3 Freeway (National Route 1), which is part of the Pacific Highway north to Brisbane. It links near Newcastle with the New England Highway, which runs west through the centre of the Hunter Valley and then north to Brisbane. Major access and through roads are sealed, but some roads in the Wine Country and Barrington Tops are not. Even though you may be unused to driving on unsealed roads, they should pose you no problems unless you are unlucky and strike heavy rain, which can make the Barrington Tops roads very slippery. Just take it easy. A car is essential if you want to get the most out of the Hunter Valley and Barrington Tops. Transfers are available from Sydney or Newcastle although driving is often the best option as you pass through interesting little towns and great scenery. If you plan to explore, take a car for at least part of your stay. Or you can choose a helicopter transfer to most parts of the Hunter Valley. It's an exciting photo opportunity you will never forget. In many cases you can land right at your chosen accommodation. Check out our Hunter Valley Map. Australian health care professionals are highly trained and medical services are among the best in the world. Medical and dental services and a wide range of alternative therapies are widely available at pharmacies. Visitors from the UK, Republic of Ireland, New Zealand, Finland, Italy, Malta, the Netherlands, and Sweden are entitled to free or subsidised medical and hospital care under reciprocal national health care agreements with the taxpayer funded Medicare organisation. It is highly recommended that all travellers should take out travel insurance when visiting Australia. Major hotels have doctors on-call. 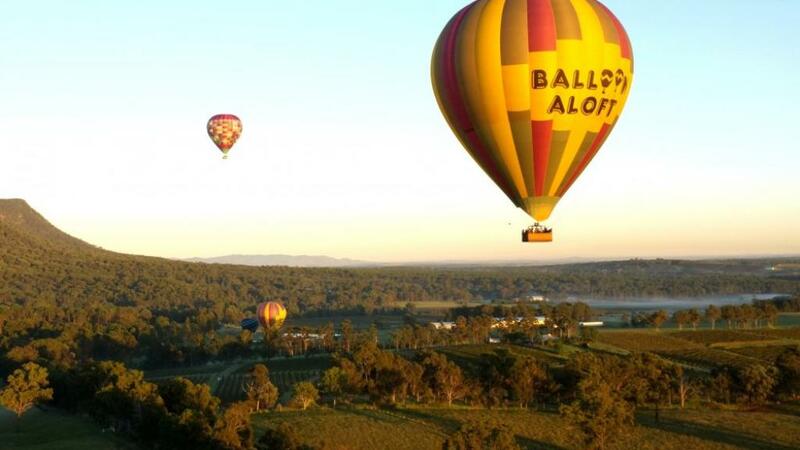 The Hunter Valley Wine Country has some of the finest restaurants in the state. Some are in historic houses, all have great food and atmosphere. You will find plenty of cafes and very casual restaurants in the Wine Country. Barrington Tops is an isolated area and guesthouses provide all meals. Some have self-contained accommodation with cooking facilities. New South Wales operates on daylight saving time from October to March in common with all eastern states except Queensland. Clocks are put an hour forward (later) for that period. Normal Eastern Standard Time is 10 hours ahead of Greenwich Mean Time. Coaches, private car, stretch, or mini-bus transfers are all available, please refer to our tours and activities page for more info or ask when booking your accommodation. Travellers cheques, especially in foreign currencies, are generally NOT accepted except by hotels, large stores and tourist shops. These display a 'travellers cheques welcome' sign. Cash your cheques at a bank or Bureau de Change to ensure you have enough spending money. The same holds true for foreign currency, which is not generally accepted by Australian businesses and shops.